We just finished walking from Raleigh, N.C., to Paris, France, and, boy, are our bodies feeling the benefits. 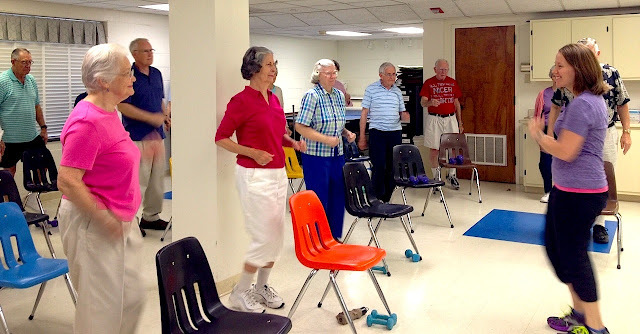 Ninety Springmoor Life Care Retirement Community residents and staff just completed a 10-week walking challenge, S.A.M.E. (Springmoor Actively Making Efforts) Goal, and recorded walking the equivalent of 13,172 miles—or a little more than the distance from Raleigh, N.C., to Hawaii (about 5,000 miles), followed by a stroll from Hawaii to Paris, France (about 7,500 miles). To celebrate this accomplishment, we held a Hawaiian-style luau to mark hitting 5,000 miles, and an “Evening in Paris” dance to celebrate reaching our 12,500-mile goal. We not only exceeded our Spring goal by about 600 miles, we nearly doubled the 6,649 miles we recorded in Spring 2012! We accomplished this by recording how much time we spent exercising every day, and—understanding that about 20 minutes of exercise is the equivalent of walking one mile—we arrived at more than 13,100 miles at the end of the 10-week period. Participants sent their mileage to me through in-house mail, or by filling out slips at the Health and Fitness Center. A bulletin board was used to update walkers on their progress. As Springmoor’s Health and Fitness director, I am incredibly proud of our accomplishment because it was the largest goal we have set for ourselves. I encouraged participants to write down any time they exerted themselves, at times reminding everyone to count the time they spend walking to the mail, or to the dining room, because every minute, and every step, counted toward our goal. Walking—as we all know, but don’t always accept—is one of the best things we can do for our bodies; it helps with strength, endurance and balance, and can help us maintain, or even lose, weight. I encourage anyone who is physically able, to walk for at least 20 minutes every day. Always wear shoes that have good traction, and make sure the clothes that you are wearing do not hinder your stride, or present any tripping hazards. Choose a safe environment and always walk with good posture. Make it fun by walking with a friend! Find Springmoor Life Care Retirement Community on Facebook by clicking here.